To get early crops, sow tender plants such as sweet corn, courgettes, marrow, french beans, runner beans indoors in pots around the middle of April, ready for planting out in mid May. Any sowing indoors will need hardening off a week before planting out; it is usually worth putting young plants out under cloche or fleece to give added protection. 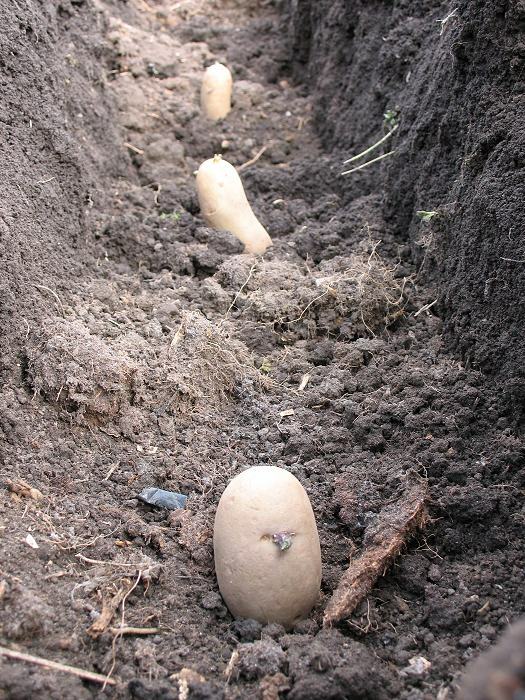 If you have not already done, at the start of the month you can plant out seed potato and onion setts which can be done right up to the middle of April. Sow leeks indoors ready for planting out in July. In early April If the weather is warm and the soil is not too wet, it is worth sowing peas and broad beans. You can also sow other crops such as carrot, beetroot, swede and turnip. Carrot fly can be a problem, make sure when the seedlings appear that you avoid touching the foliage as the carrot fly can smell the leaves from up to ½ a mile away. Another way to prevent attack is to erect a barrier about a foot high from the ground, the carrot fly, flies low to the ground and this prevents them getting to the carrot crop. Crops such as courgette, marrow, pumpkin; you can dig out a spade of soil and add some manure and replace the soil so you have a mound. It's also worth putting in a short length of pipe such as old plastic downpipe, about 6" - 1ft long, place some grit in the bottom of the soil, put pipe in and cover with remaining soil. If you get a dry spell then you can pour water down the tube which will go straight to the root system of the plant. Perennial plants such as asparagus and globe artichoke, they should be showing new shoots sprouting from their winter dormancy. As they can stay in the same place for a number of years it is important to remove weeds as much as you can around them. With globe artichokes, if any plants have not made it through the winter, you can easily take off a piece from another healthy plant and if the soil is wet transplant or if the ground is dry pot on. Rhubarb should be growing well, pick the thin shoots as are the most tender. Plant out summer cabbage and cauliflower that were sown indoors in February March. Greenhouse; clean and prepare for new season, tomato, peppers and cucumbers will be ready to plant out later in the month. If you have any advice or tips about gardening relating to this month contact us and if suitable will add to the page - please local to Haworth and the surrounding area only.